TV could be the new focus at CES 2011 with major consumer electronics putting out some of their best and latest TV innovations. To keep up with the market, interestingly, Cisco is marking an entry into the smart TV market with its Smart TV box. RCA too is coming in and introducing their dual-reception portable TVs. Another company called Amino said today that it will introduce its Over the Top (OTT) set-top box called Freedom Jump. The box allows complementary service to cable and satellite TV and also allows on-demand services. Apple and Google had an early start by offering smart TV products but Cisco is making sure it enters the consumer market with its own unnamed smart TV product. Cisco is said to be taking a different approach and sell internet-connected smart set-top box to cable TV operators who would loan them to consumers. Cisco is to announce the product at CES. While all this is good, RCA is launching a new line of portable digital TV sets. The TV’s come in two sizes, 3.5 inch and 7 inch model and can recieve both digital and mobile DTV. 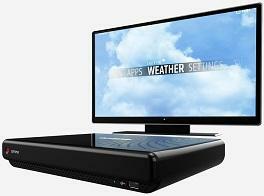 The TV’s are all packed with Lithium Polymer battery and allow playback of up to four hours. They are priced at $109 and $169 for the 3.5 inch and the 7 inch models respectively. Next LinkedIn to go Public this Year!